Hyperbole is the awesomest thing in the awesome history of awesomeness! OK, maybe that’s a bit much. In fact, most often, overstating an opinion does more harm than good, especially in the realm of music criticism. 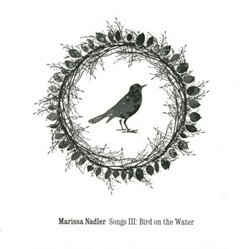 For example, when Marissa Nadler’s new album, Songs III: Bird on the Water, crossed my desk, it was accompanied by an email from her publicist — who does what publicists do very well, I might add. In the missive, she had pulled quotes from two well-known and moderately respected music publications, Mojo magazine and Chi-town’s hipper-than-thou snark conglomerate Pitchfork Media.com. Using its completely arbitrary points rating system, Nadler’s record received an 8.1 from the Chicago judge, who called it “the most engaging singer-songwriter release this year.” Wow. The former gave the disc an equally arbitrary and meaningless four stars and dubbed Nadler “the most incredible thing happening in music right now.” Holy cow! Really? That’s unbelievable! Actually, it is, but that’s no slight against Nadler. This record brims with dark, brooding melancholia, expertly crafted by a nimble wordsmith with a gift for melody and beautifully expressive vocal abilities. It’s just not the greatest thing since sliced bread, as some publications would lead you to believe. Equal parts M. Ward and Mazzy Star, Nadler delivers stark Gothic Americana as soothing as it is spine-chilling. Comparisons are the crutch of a lazy reviewer, but anyone who doesn’t hear a touch of Hope Sandoval or reflections of Ward’s The Transfiguration of St. Vincent isn’t paying attention. The songwriter wraps herself in barren sonic landscapes — fleeting cello lines float above discordant synthesizer strains while spectral backing vocals evaporate and reappear seamlessly — all of which augments her deathly lyrical imagery. By adding enough vocal reverb to make My Morning Jacket’s Jim James blush, Nadler conjures up a truly ghostly collection of heartbroken laments. You might want to listen to this one with the lights on. Is Marissa Nadler’s work revolutionary? Probably not. But she’s a very talented songwriter, and Songs III gave me shivers on more than one occasion. If you dare — and I’m not sure if I do — check her out this Sunday at Bennington College.